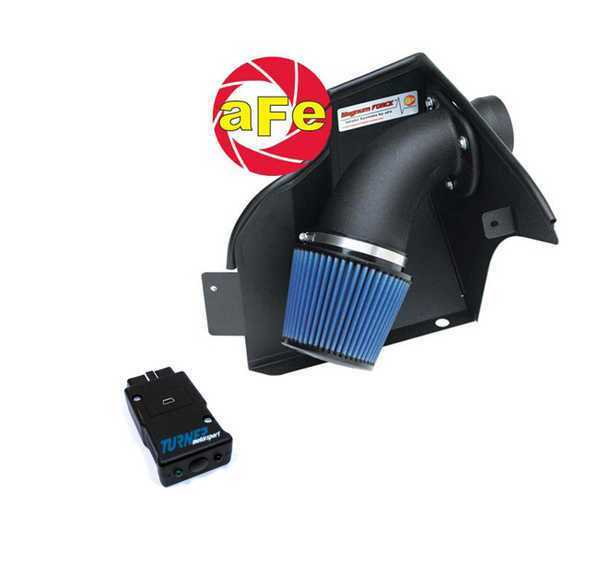 Our base Stage 1 kit featuring a cold-air intake kit and matching performance software. The aFe air filter benefits from a heat blocking shield - drawing cool air from the factory intake ducts to feed the engine. aFe uses an oiled cotton air filter for maximum air flow and excellent filtration. The kit is supplied complete with heat shield, intake tube, sealing materials, hardware, and install instructions. Both of these items are packaged and tuned to work together. They provide a solid performance boost with a low upfront cost. For an excellent 'bang for the buck' upgrade, the software and intake are a great choice. This Package can be upgraded to Stage 2 by adding the larger HFM, "24lb" fuel injectors, a larger air intake kit, and Stage 2 software.